Once your equipment is connected and ArduPilot is configured, follow the instructions below to get standard FrSky telemetry displayed on your RC transmitter. If you installed FrSky sensors on your vehicle, other messages from these may also appear during discovery. Please refer to the OpenTX manual for how to display values from the FrSky telemetry feed on the RC transmitter’s screen. If upgrading to OpenTX 2.1+ you will need to replace your OpenTX 2.0 configuration and “discover” your sensors. There are other minor “oddities” - for example T1 (flight mode) and Tt2 (number of sats) are both called TEMP (switching mode helps you identify which is which). FrSky telemetry data consists of 16 or 32bit unsigned integers recognized by OpenTX. Standard FrSky telemetry does not include flight controller messages natively. Therefore, less important telemetry data messages (temperature, variometer…) have been repurposed to carry more useful information such as flight mode. 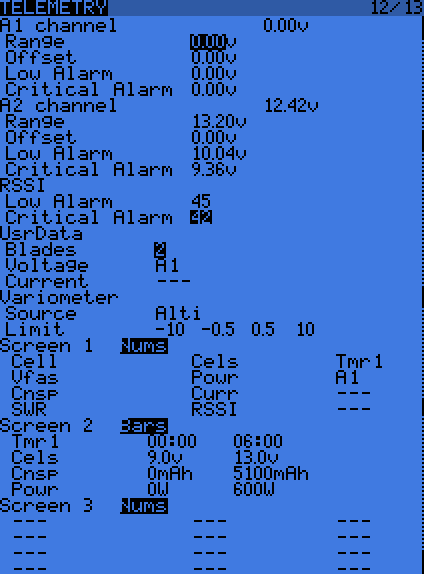 In the example below, the variometer function of OpenTX is configured to use the discovered VSpd sensor value. The value is only considered if it is between -10m/s and 10m/s. In the center band -0.5 to 0.5 m/s the variometer will be silent. For a more detailed video of how to setup the variometer, you may check out this video ArduPilot already provides variometer values through the FrSky telemetry link, so the FrSky variometer sensor is not necessary. You can setup the display of the latest transmitted latitude and longitude information; for instance, in case of a crash or fly away, to locate your copter. For information on how to configure your ErSky9x transmitter (such as a Turnigy 9XR Pro) for FrSky telemetry, please go here.